Bonding with your big kid is just as important as bonding with your baby. Older children need love and secure attachment relationships too, as their brains are still growing and their foundations still being laid down. Do any of these comments seem familiar to you? I hear this kind of thing almost daily, and while part of me rejoices that now, at least, these parents do know how fantastic slings can be for family life, I appreciate their sadness. But did you know, big kids like to be carried too? How many of us have hoiked our hefty toddlers onto our hips when their legs get tired of trundling along, or felt little arms wound around our necks when they are tearful? How many of our huge preschoolers still appreciate long hugs and piggyback rides? All children need closeness, long beyond the baby stage, long after they take their first steps, long after they start school… and so do grown ups! Loving contact is vital to our emotional health, from cradle to grave. 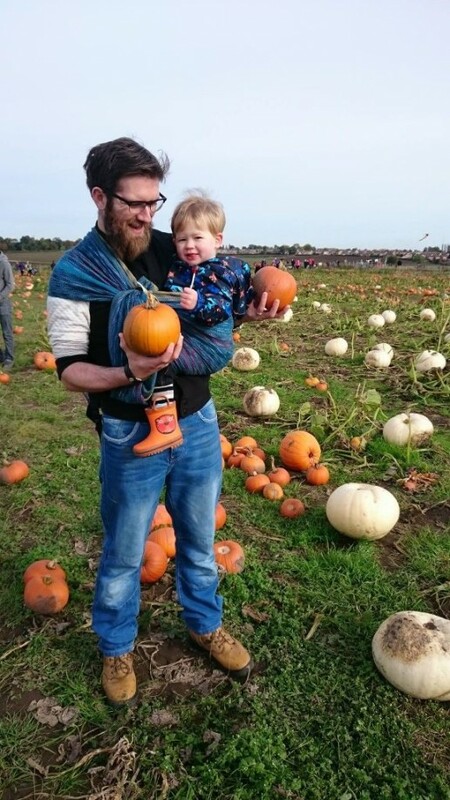 A sling is, at its most basic, a tool for enabling close contact, almost like another pair of enfolding arms around your child, while your real arms can be used for other things. 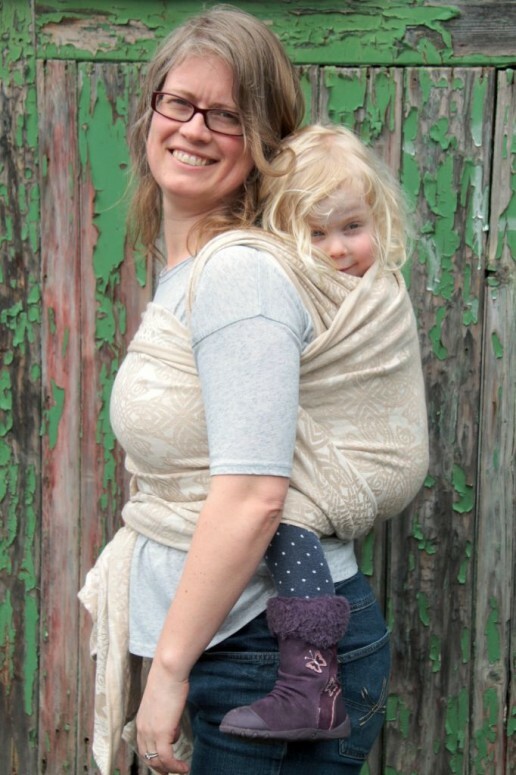 A good sling, when used well, provides a feeling of all-around gentle pressure, as if being hugged all over. This can be very valuable for children struggling with sadness, with sensory overload, with tiredness, or fear from loud noises, for example. Being close to a parent’s body is reassuring and sends a valuable message to a child that “You are loved. I will look after when you are unhappy, I will keep you close when you need it. I am always here for you.” There are many other advantages to slings beyond this opportunity for connection; not least that they can be very comfortable and help to distribute the weight of a child around your body evenly, making it much easier and much less tiring than in-arms carrying. They can help to provide nourishment – breastfeeding or bottle feeding on the go, they can make school runs easier, allow greater freedom in exploration, enable naps, and keep exuberant runners out of danger in crowded areas or near roads etc. 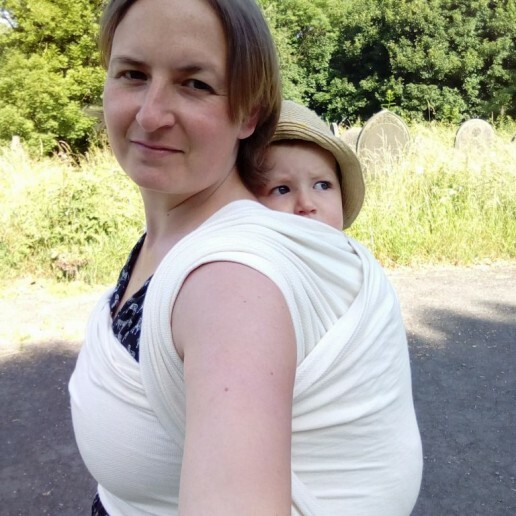 You can use pretty much any kind of sling with a bigger child, even a stretchy, if it is a high quality hybrid one like the JPMBB or the Ergo wrap. I’ve helped a couple of parents with toddlers find the stretchy love, as there’s nothing quite like the enveloping gentle bounce you get with these. They do tend to work best and most easily in front carries. Ring slings can be fantastic, if you have the shoulder style that suits you best (pleated vs gathered), and made of a fabric that is supportive enough. People often suggest linen or hemp or silk to add strength to the softness of cotton, which indeed they do, but many 100% cottons are more than sturdy enough for heavy children, who can become easier to carry as they develop more core strength and become more compliant and easier to carry than the “bowling ball stage” – it’s worth trying a few out! You can get toddler size meh dais, half buckles and full buckle carriers, even some up to preschool size. 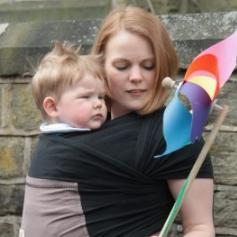 Again, it is worth trying a few out at your local sling library as one size does not fit all, and the body size and shape of the carrying parent plays a part too (some preschooler carriers will just be too big for petite mums, for example). Waistbands may need to be worn lower (around the hips) for front carries, and some creative methods for getting a good seat in a back carry may need to be employed! 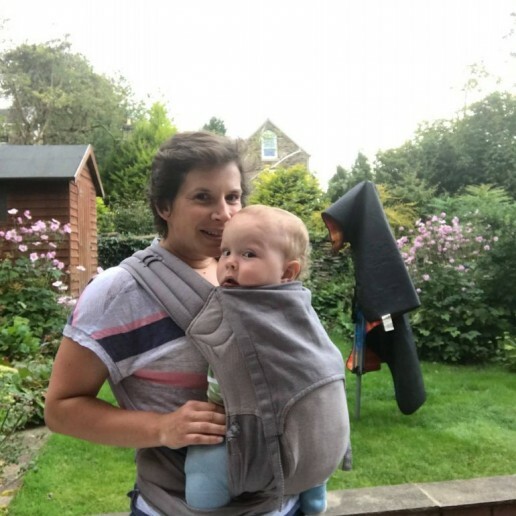 Please do take advantage of your local sling professionals about whether you need a bigger carrier for your child; it may be that your current carrier just needs a few tweaks in technique to get the most out of it. Many people upgrade to toddler carriers earlier than really necessary, and too big a carrier may be more problematic than one thats just a touch small (see my “beyond the knee to knee” article for more information). What about the inevitable comments “he’s too big to be carried like that, he should be walking!” or “You’ll just make that child clingy, you know”? Well, I think a sling is as valid a means of transport as a pushchair, and far more comfortable than achingly weary in-arms carrying. 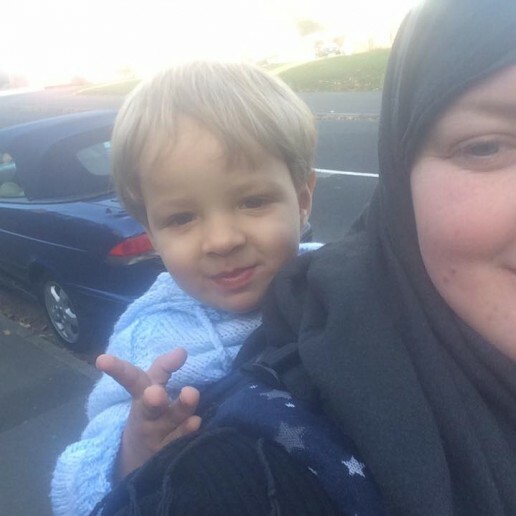 Don’t be afraid to carry your toddler – for every comment you get, you may well have planted an idea in someone else’s head. Ensure that your child doesn’t feel hurt by any comments, sometimes talking about any incidents together afterwards can be helpful. 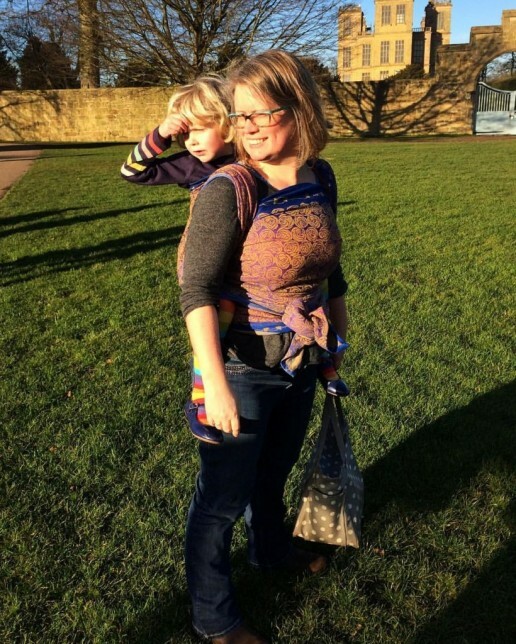 Using a sling for your bigger child from time to time will not harm them, nor will it make them babies again, any more than a hug or a hip carry would do. My big girl, who was nearly 4 at the time of writing, is much less often carried these days; much to my chagrin.. but she is vocal about it when she does want to be carried, climbing up me and wrapping her legs around my waist. I am happy to oblige as I’m never sure how many more carrying days we have left to enjoy. She has moods, and disappointments that the world doesn’t revolve around her, and sometimes she finds it hard to wind down. Often, at these moments, a sling has been our saviour, holding her close so she can relax, feel safe, and listen to my reassuring murmurs, while I can still get on with some of the things that just can’t wait, or save my back and arms from her lopsided weight! 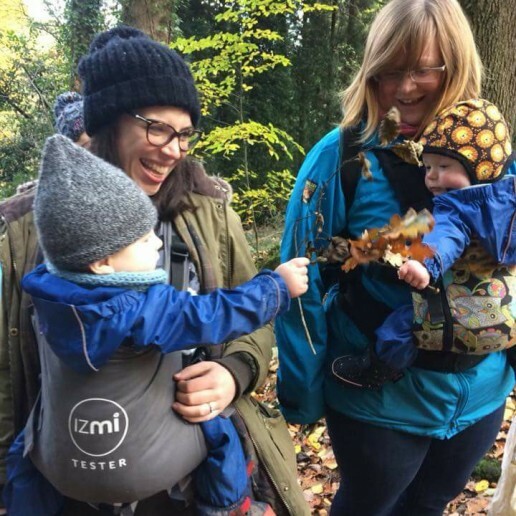 We use all sorts of carriers – ring slings for quick up and downs, woven wraps for sleepy cuddles, preschooler buckle carriers for rainy school runs, warm snuggly half buckles for winter walks. 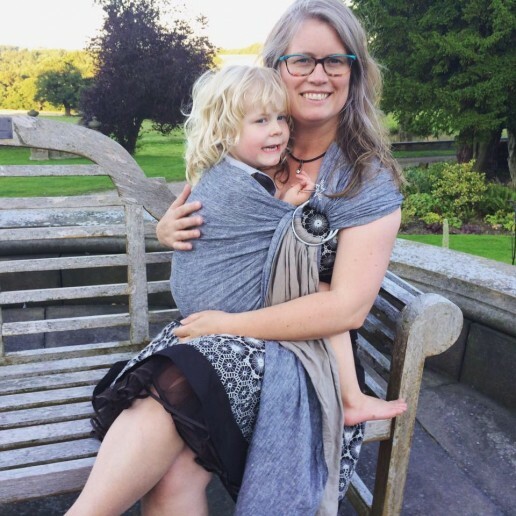 Even my (then) six year old found a wrap carry a great reassurance one day when he got separated from us at the Yorkshire Sculpture Park; he was very distressed when found half an hour later and just wanted to be holding onto me. My husband’s shoulders got pretty tired after a few minutes; but I was able to carry F on my back for well over half an hour, due to the support and the weight distribution, enough time for him to feel reassured and connected again. I found it really helpful too – it was a pretty horrible forty minutes and having him in close contact was very valuable for my own feelings and allowed me to breathe and absorb, and move on. I’ve got to know one family with a preschooler pretty well, they hadn’t used a sling for over a year, but started again, almost from scratch. Here’s what they have to say about their experience of carrying a bigger child. After starting nursery, H became anxious and disconnected. She chewed her fingernails to a painful point, and became difficult to communicate with, as well as regressing in toileting. Instead of adopting behavioural control techniques, I drew on my experience from other parts of our lives and adopted a regression tactic. A big part of this was returning to carrying her in a sling. We had used our high-street carrier rather than a pram on our dog walks, but had given this up over a year before as she had outgrown it. We wondered if a ring sling would be a solution for short snuggles for reconnecting. H was too heavy to attempt this from online videos, so we booked a workshop with a local sling consultant, who reassured us that she wasn’t too big, and showed us how to ensure we were all comfortable. The ring sling has been perfect for our needs and has really helped us all. More often than not, it has doubled up as a dramatic scarf for the 80% of the time H wanted to walk! I’m working with another lady whose older child is struggling to accept their brand new baby. She asked me to show her how to breastfeed her baby in a sling, in the hope that this would allow her to be hands free to play with her toddler. 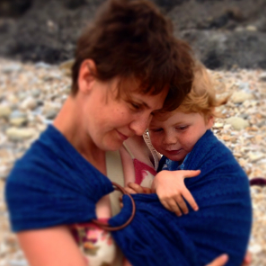 She’d never carried her first child but was loving the slings with the little one. Successful breastfeeding in a sling is a challenge that requires care to do well and safely, and in my opinion is never fully hands-free. However, one hand available can make a big difference – you can hold a book to read, help with a jigsaw at the table, stir a mixture, hold a hand, for example. 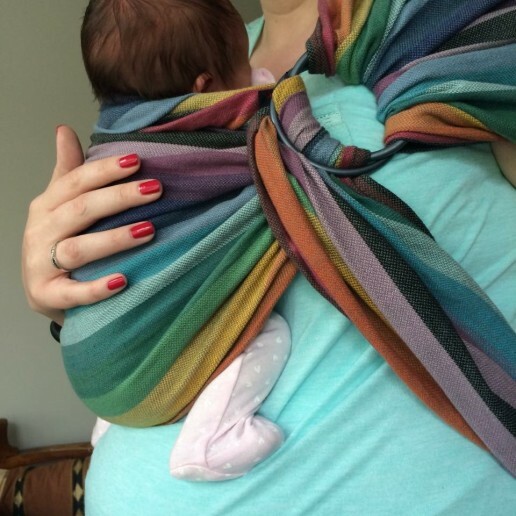 Amongst other things, we looked at a ring sling, which can be used for little babies as well as bigger children who love to sit on the hip and look around, so it is a carrier that can be used for children of multiple sizes. Hopefully, carrying the bigger child from time to time while the baby is sleeping, or in a pram or carried by Dad will be helpful for dealing with big feelings and the need to know that his Mum is still Mum and will always be there to meet his needs, even with the new addition taking up so much of her time. There are some carriers that can be used with small babies and bigger children; which means the same carrier can be used for both children when needed. 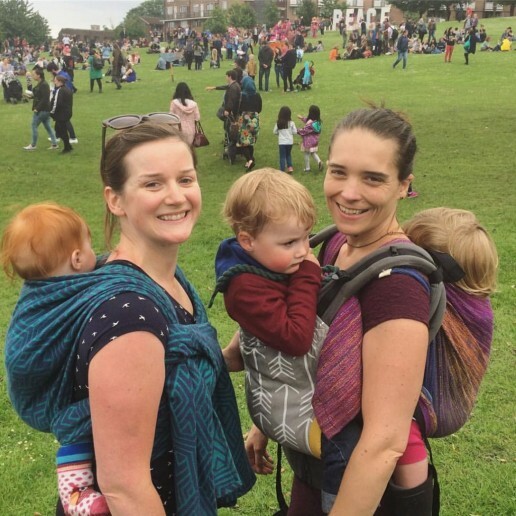 The ultra- versatile ring sling and woven wraps are good examples, which mould around the parent-child dyad and can be used from birth to preschool age and beyond. Some mei tais with adjustable width can work well for families with children born with a small age gap. The buckle-waist equivalent half-buckles can be useful, or those with wide wrap straps that can be tied in such a way that bigger children will be supported knee to knee. 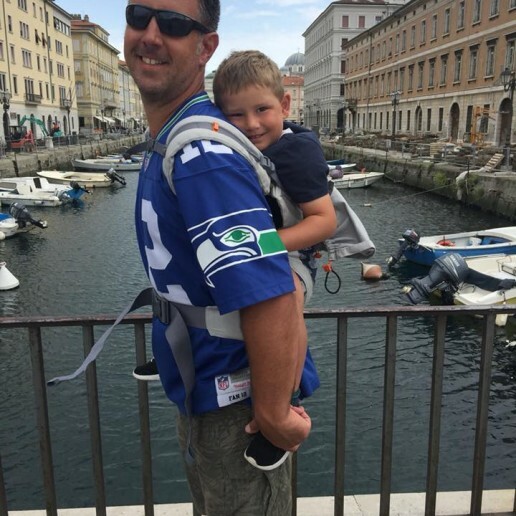 Some full buckle carriers can be used from birth and their panels can be adjusted to the size of the child. Some come with inbuilt adaptations for using with babies, and some have separately purchased inserts for small babies to rest on until they grow big. Do visit your local sling library or get in touch with a sling consultant for some help navigating all these options; there will be something to suit nearly every situation! During pregnancy, carrying an older child can be an opportunity to help deepen relationships and prepare for the new arrival, being reassuring that things really are going to be all right after all. Carrying while pregnant has its own challenges too; ensuring the bump isn’t compressed, that weight is well distributed, that any symphysis pubis discomfort is not exacerbated. 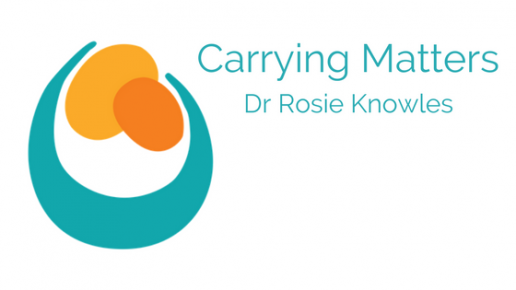 Do see your local sling consultant or chiropractor or physio for help if you need (bearing in mind that many health care professionals may not be up to date with ergonomic, safe carriers.) There is more reading here about carrying while pregnant. In summary, older children do not stop needing the love and support of their caregivers for a surprisingly long time. Our society seems to believe that we should encourage separation of children and caregivers as young as possible, to breed “independence”, when actually, neurophysiology suggests that children will learn independence at their own pace, as their cognitive and emotional capacities develop.